1968 Charger R/T – Pictures of my 1968 Dodge Charger R/T project car. Information, Links, Photos and more. 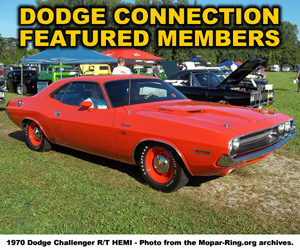 Dodge Challenger R/T Resources – Dedicated to Dodge Challenger R/T owners and enthusiasts. Site features Information, Links, Pictures, Screensavers, Desktop Wallpaper and more. Own a Dodge Challenger R/T? Have it featured on this site.. Dodge Coronet R/T Resources – Dedicated to Dodge Coronet R/T owners and enthusiasts. Site features Information, Links, Pictures, Screensavers, Desktop Wallpaper and more. Dodge Coronet R/T? Have it featured on this site. Dodge Dart 340 Blog – 1969 Dodge Dart 340 Blog, vintage pics, dragrace, car meetings, bikes and many other things worth blogging. See what happens in mopar Germany, see the restoration of my 1969 Dart and the meetings and races I visit with this car.